I was tagged by the lovely SabiWabi From OyHabibti for this Meme called 5 (Random) Things That I Love. Well, of course I love my family and friends and above all, Allah. This tag is more like little pleasures, or at least that's how I'll take it. There is no television show that I have ever followed with such fervor and dedication. It's that good. The writing is phenomenal. They always have you at the edge of your seat going WHAT THE?!?! The last season is a mere 77 days away and I only know this because I have a countdown on my LOST BLOG! I love 'em. The glossy paper. The smell of the perfume ads. I just love magazines. Even more so now that I can't get them easily. My mom brings some fromt he US when she comes so that's great. 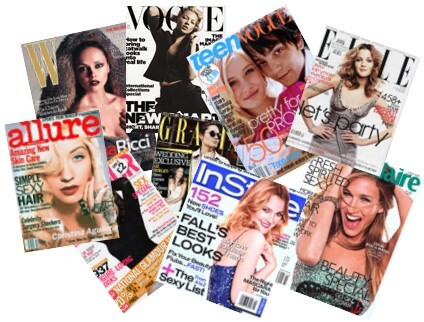 Oh, and online magazines will never be the same as the real thing, in your hands/bag. I love this cat! Not this much, but a lot. I'll buy stickers and notebooks with her image cause they make me happy. Can't find real Sanrio here but if it looks real, I'll buy it. I adore chocolate. Does anyone not? My favorite is dark chocolate with mint. MMmmmm. Lindt makes a good one. I'm an equal opportunity chocolate eater though. I like white Toblerone with the toffee bits and Cadbury dairy milk too! The internet is the best, coolest most wonderful thing invented. It's amazing, really all it provides to us, information, entertainment, socializing. I keep in touch with my family mostly by way of the web. I met all of you fabulous people here too. It's fantastic! Any thought or question that crosses my mind, from...hmm I wonder why people hang shoes from telephone wires to what's my kid got? I can find out within seconds. I Love the internet! Im with you on chocoalte and hello kitty! Khadra, how bout Hello Kitty shaped chocolate? Too cute to eat? Nah. I love you list! The last picture is so cute! Melissa, hee, I luv teh lol cats! You must detox off of Lost, Mona. It will never make sense. Sabiwabi, I'll be forced to when it's over and if it doesn't end satisfactorily there will be a long, loud NOOOOOOOO resonating from the Egypt area.